Posted on 17, April 2018 by EuropaWire PR Editors | This entry was posted in Finland, Food & Beverage, Marketing, Spain and tagged Alimentaria, Alimentaria2018, dairy, lactose, lactose free product, protein, protein snacks, snacks, Valio, Valio PROfeel®. Bookmark the permalink. HELSINKI, 17-Apr-2018 — /EuropaWire/ — Valio has over 110 years of experience in dairy innovations and is a true pioneer in lactose free products. Today, Valio is bringing selected products from its globally largest lactose free –sin lactosa– portfolio to the Spanish consumers, which taste great, are of high quality, and are filled with natural goodness that has roots in the pure Finnish nature. Alimentaria is the leading trade show for food, drinks and gastronomy in both Spain and the Mediterranean Arc ̶ which is also considered as international benchmark in the industry. In 2016, Alimentaria hosted a total of 140 thousands visitors in total, with 45.000 international visitors from 168 countries. This year, Valio ̶ the most innovative dairy in the world from Finland ̶ is present in hall 4 Interlact, stand A 147 presenting its new lactose free product portfolio and Valio PROfeel® protein snacks. Valio has the largest range of lactose free products in the world. The exhibition is open for B2B visitors on Monday to Wednesday from 10:00 a.m. to 7:00 p.m. and on Thursday also for consumers from 10:00 a.m. to 6:00 p.m. in Gran Via venue, Barcelona. 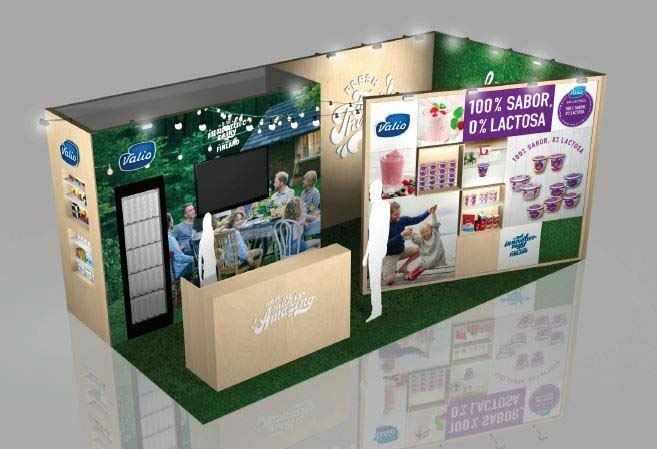 Valio is presenting a new lactose free ̶ Valio sin lactosa ̶ product range for the Spanish market. “We are excited “, says Anette Almi, Valio’s export manager, “to bring the delicious lactose free products to Spain. We believe that all dairy products should taste great and be full of flavour, even if they are lactose free. Spanish consumers also want such products so we worked hard to make sure we’ve listened to them and focused on fulfilling that promise of high-quality products with 100% taste, 0% lactose,”. Valio is a pioneer in lactose free products, having launched the world’s first lactose-free milk in 2001. Today it is the world’s leading expert on dairy products without lactose. Valio is also continuing with the Valio PROfeel® brand portfolio in Spain by renewing the package design. Valio PROfeel® products are a convenient source of high-quality milk protein, which contributes to the growth and maintenance of muscle mass as part of a varied and balanced diet and a healthy lifestyle for those who want to take care of themselves or just enjoy a healthy snack.